Approximately 4 weeks after his wounding at the Second Battle of Bull Run, John W. Derr sat in a small hospital ward on the campus of Georgetown College (now Georgetown University). Owing to the large number of wounded that had been produced at the battle of First Bull Run as well as subsequent smaller battles, small hospital wards were popping up all over Washington City. 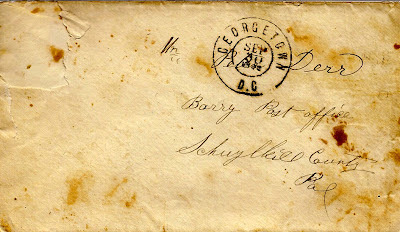 The most famous of which was the Patent Office in Washington, where tens of thousands of Union soldiers were treated, recuperated...and in some cases...died. The nation...both north and south...was ill prepared to handle the vast load of wounded soldiers that the war produced. The initial thoughts of a three month war with all of the glorious heroics of battle, instead turned into a bloody, screaming nightmare. Washington City...essentially as small sized backwater type town...overnight was turned into a combination armed encampment as well as the largest hospital in the world. As I stated in prior postings, this human tragedy along with the wounding of his brother, was what drew Walt Whitman to Washington City to serve as a nurse. As is true in most wars, great benefits resulted from initial tribulations. Better surgical techniques were developed. Better doctors...with battlefield training...were produced. Lesson were learned about hygiene, cleanliness, and sanitation. Better hospital architectures were designed to add in the recuperation of the wounded and ill. New techniques in anesthesia, operations, and nutrition were born of the experiences in the Civil War. We, as Americans, have both our nation and these developments as gifts from our brave soldiers. 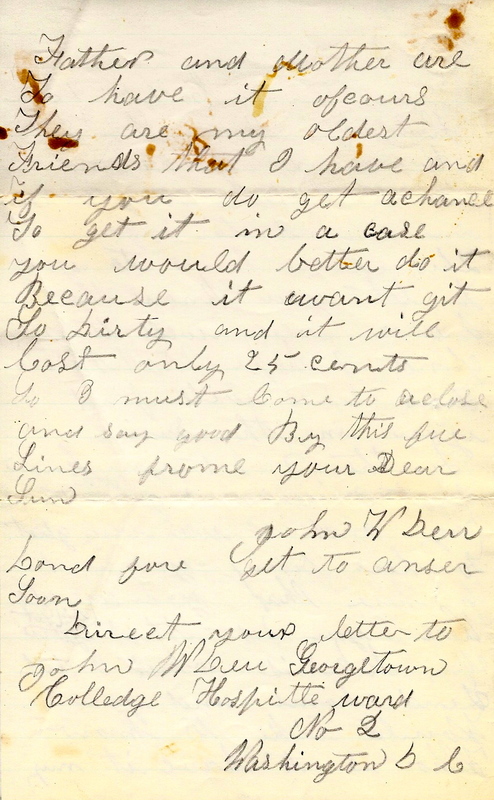 In the letter dated September 29, 1862, John has very little to say to his parents. As you would expect, his letter is primarily to inform his parent that he is healing well and that he is getting better. This is an interesting letter to me, in so much as it took him an additional four months to recuperate and return to his unit. As was true of such wounds during the war, the ups and downs of infection and other illness acquired while staying in the hospital wards along side many other sick and dying men, probably contributed to his roller coaster recovery. I find that with what he described as a minor wound taking five months to heal, that his wound was much more serious than he disclosed to his parents. Additionally, his post war inability to sustain work and his disabilities indicate that this was indeed a very serious wound. Undoubtedly the initial wound appeared to be minor, with post injury infections and secondary diseases causing further damage to the muscles, tendons and skin on his leg. However...that was not something to write home to parents. After his final recovery and return to service John was made the company Wagoner and he spent most of the war driving team between battle line service. His injured leg made this a better option vs. long marching. It did not, however, preclude his participation in battles and other operations described in later letters. 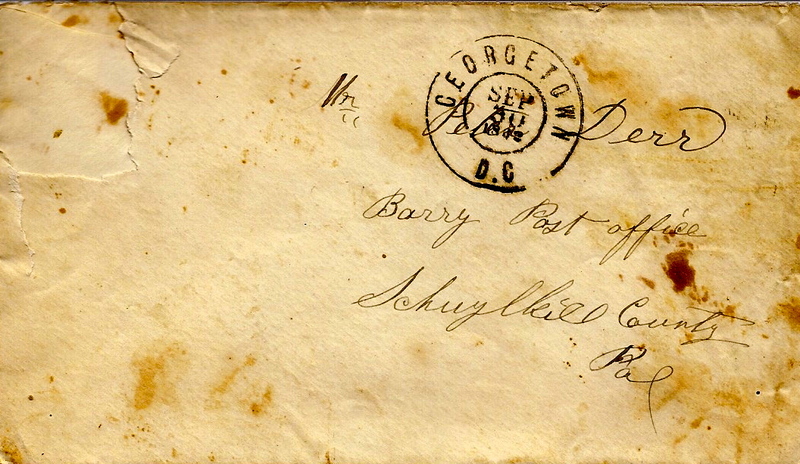 The photograph above is a "likeness" taken as some unknown period in the life of John W. Derr. The original photograph has no date indication. 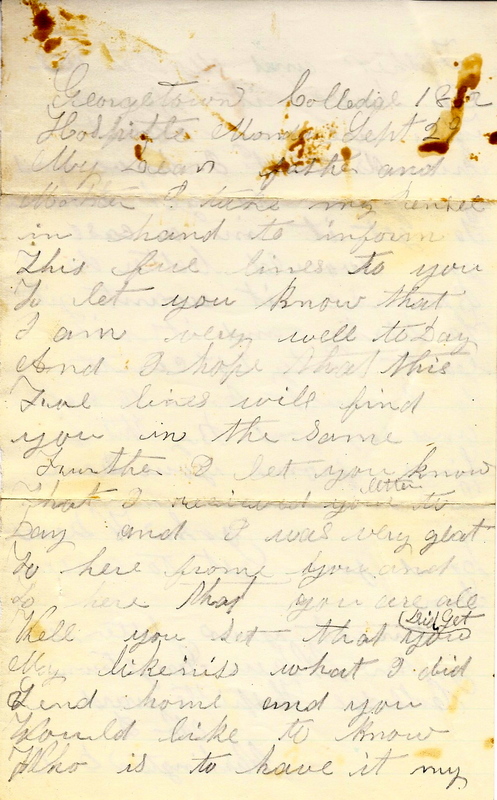 More than likely it is a post war image, but I include it here as a reference to his image and "likeness" that he mentions in this letter. 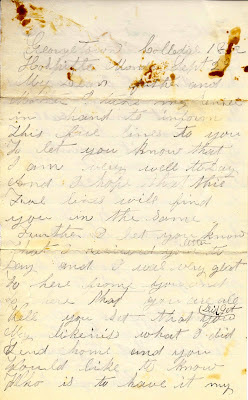 I find his interaction in this letter very touching...as he shows his true feelings for his parents. This is, I imagine, a common emotion felt by many lonely, scared and tired soldiers during all wars. I take my pencil in hand to inform this few lines to you to let you know that I am very well today and I hope that this few lines will find you in the same. Further I let you know that I received your letter today and I was very glad to hear from you and to hear that your are all well. You said that you did get my likeness what I did send home and you would like to know who is to have it. My Father and Mother are to have it of course. They are my oldest friends what I have and if you do get a chance to get it in a case you would better do it because it won’t get so dirty and it will cost only 25 cents. So I must come to a close and say good by this few lines from your dear son. Don’t forget to answer soon. 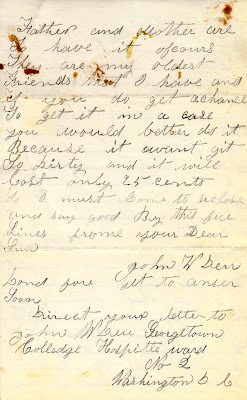 Direct you letter to John W. Derr., Georgetown College Hospital, Ward No. 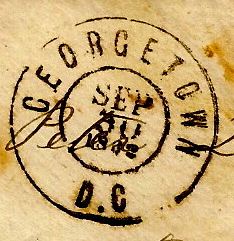 2, Washington, D.C.